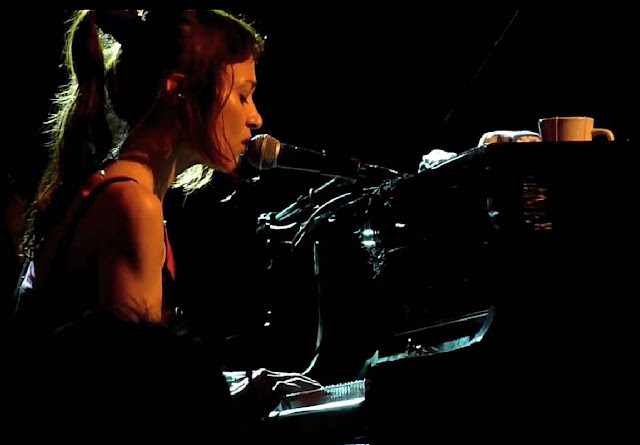 Diva Devotee: New Music: Fiona Apple "Valentine"
New Music: Fiona Apple "Valentine"
In anticipation of the release the singer-songwriter has been playing a number of small gigs in the States and a video, filmed in Austin, Texas,of a new song called Valentine has surfaced. With its opening, sombre, jazz inspired chords, periodic contrasting, sprightly and jaunty refrains and that gorgeous contralto voice, it sounds as if Fiona Apple is sticking to tried and tested ground with this album. But that's no criticism. The music world, and me, needs her dark, and introspective ruminations now more than ever to counterbalance the euro-dance/pop movement that is currently giving my brain cavities. In fact its made me so eager for some musical Ritalin right now that I've dug out my Fiona Apple back catalogue to tide me over. Check out two of my favourite Fiona Apple songs, Never is a Promise and The First Taste, both taken from her first album Tidal. She is another artist that is shockingly overlooked and does not get the coverage she deserves. I most certainly shall be buying the new album! Oooh her newest offering, just for you DD! The audio didn't want to work on Dspy, but Youtube has it. Thanks for bringing it to my attention! The melody is very fluid, so am going to need to give it a few listens to get a hold of it. What do you think? I love it! Her voice seems a little worn but very intense in places and it suits her well, there is nice variation of colour! Also loving the flo style chants! The sparse arrangment and music box style is cute and serves the chorus very well! But yeh it seems that you press the play button and its over way too soon!